This topic describes how to import users from Workday to OneLogin using Workday Custom Reports, essentially treating Workday as your user directory of record. 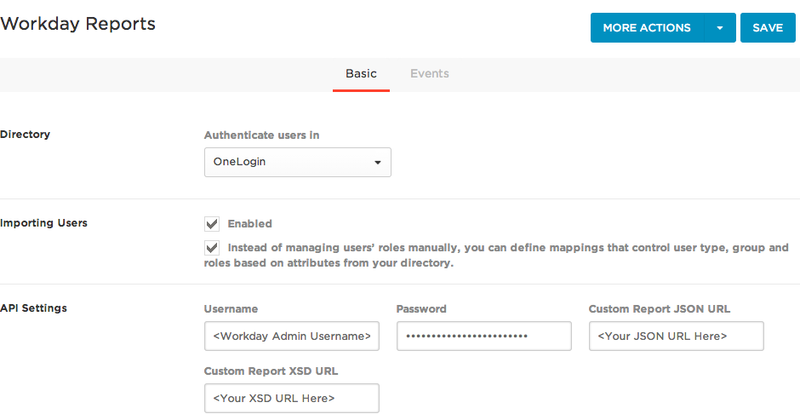 You can use also OneLogin to import users from Workday to Active Directory or other LDAP directory. For more information, see Provisioning from Workday to Active Directory. 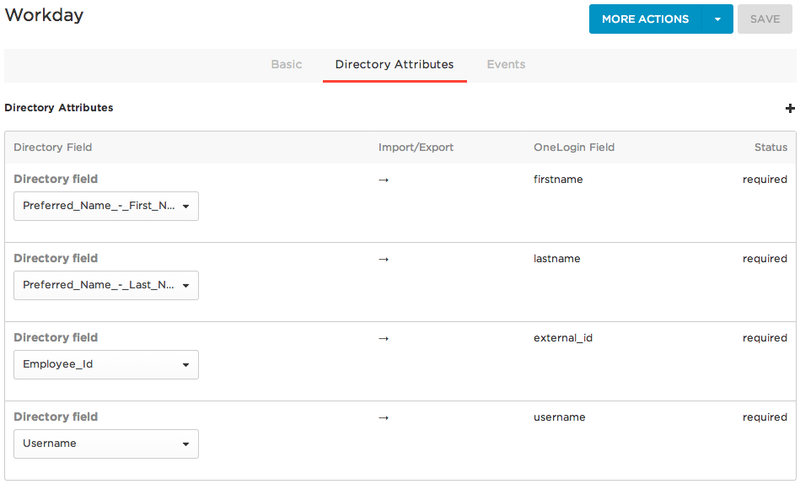 If you also want to export user attributes from OneLogin (or a third-party user store like Active Directory) to Workday, see Workday Bidirectional Directory Connector. Note. If you just want to set up SSO for Workday, see Configuring SAML for Workday. You should familiarize yourself with the attributes in your Workday user list, specifically the editable Default Fields and XML Overrides. Log into Workday as an administrator. Go to Webservice > View URL. Copy the JSON and XSD URLs and save them for insertion into OneLogin's Workday Reports page. Go to Users > Directories, click New Directory, and select Workday Custom Reports - Beta. Give the directory a name, and then choose OneLogin under Authenticate users in. Click Save to open the Workday Reports configuration page. Ensure that both check boxes under Importing Users are enabled. Under API Settings, enter your administrative username and password, as well as the XSD and JSON URLs that you copied from Workday. Click Save to generate the directory and allow you to access the Directory Attributes page. On the Directory Attributes page, map the custom Workday attribute fields to OneLogin fields. When you have mapped the user fields according to your account configuration, click Save. Workday should now be exporting users with their defined attributes into OneLogin.